The PPPC-statistics were fairly weak over July, but the August performance was again strong in softwood, especially taking into account the summer season, but remained subdued in hardwood. Total paper grade market pulp shipments were up in August by 5.6%, y-o-y, and now up by 3.7% cumulatively. For market BSKP, those changes were +9.5% and 3.4%, respectively. Shipments of all grades to Western Europe were up in August by 1.9%, y-o-y, but still down by 0.6% over the first eight months. Market BSKP shipments to Europe showed a healthy 4.2% increase for the month, y-o-y, but a small retreat of 0.5% over the first eight months. Producer stocks for all grades were flat in the standard calculation but down by one day, seasonally adjusted, against July 2016. The softwood pulp stocks behaved exactly as the total. Our PIX NBSK index eased down marginally, i.e. by 6 cents, or by 0.01%, and closed at 809.75 USD/ton. US dollar strengthened against the Euro by 0.4% (weekly average, wk 38). With the weakening of the Euro against the US dollar, the benchmark value in euro, converted from the dollar value index with the average exchange rate of last week (wk 38), moved back up from last week by 2.78 euros, or by 0.39%, and the PIX NBSK index value in euro-terms settled at 723.64 EUR/ton. level of 1.25 million tons, while high, was below port stocks at the end of August 2015. 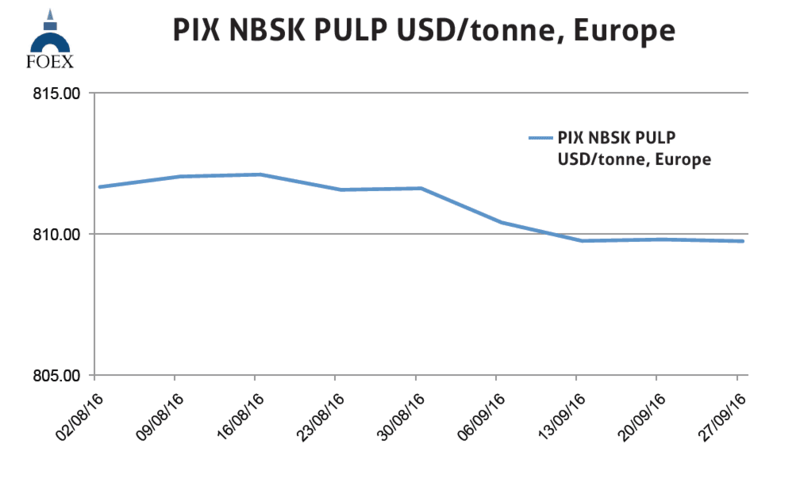 Our PIX BHKP index value retreated again, this time by 51 cents, or by 0.08 %, and closed at 661.64 USD/ton. In week 38, the value of Euro depreciated by 0.4% against the US dollar (weekly average). When converting the USD value of the BHKP benchmark into the moderately weakened Euro, the PIX BHKP index value in Euro moved up by 1.86 euro, or by 0.32%, and closed at 591.28 EUR/ton. The first half year paper and paperboard production numbers have now been published by most of the key countries and regions. In graphic papers, the global supply (and demand) continue to sink. Over the first six months of 2016 production was down in CEPI-countries by 3.7%, in USA by 4.5%, in Canada by 3.8% in Japan by 1.3% and in South Korea by 2.1%. Brazil showed a growth of 1.0%. In tissue, production grew in all key countries, except for South Korea. E.g. in CEPI-countries, the growth was 2.5%, in the US 0.5% but in Japan as much as 5.0%. Sep.27, 2016): The August data on the paper and board industry shipments looks better than what it really has been, due to two more shipping days in August 2016, compared to August 2015. Helped by this high number of working days, e.g. the North American printing and writing paper statistics (by PPPC) show a 2% rise in total shipments, y-o-y. The cumulative numbers are still down by 2.5% compared to the January-August volume shipped in 2015. Woodfree papers did this time clearly better than the wood-containing ones. In uncoated free sheet, the largest grade, the gain in August was 3.3% and also the cumulative number over the first eight months was marginally positive at 0.2%. In Europe, no data on paper industry production or delivery volumes over August is at our disposal at the time of writing this report. Even if some pick-up has been reported now in September, most of the August data is likely to come out fairly weak, even seasonally adjusted. The order books were short in August and prices were under pressure in many grades. In container boards, July numbers showed a 4.4% y-o-y decline in the European total, much worse than the cumulative retreat, which is still nearly 2.5%. Recycled paper based case-making material producers have been repeatedly disappointed through the summer in their efforts to raise prices. In North America, some of the packaging sector price increase attempts seem to have more wind under their wings. the price trend of the products in question. FOEX sells the right to banks and financial institutions to use the PIX indices for commercial purposes, while RISI Inc. has the exclusive re-selling rights for subscriptions to the PIX data and market information. 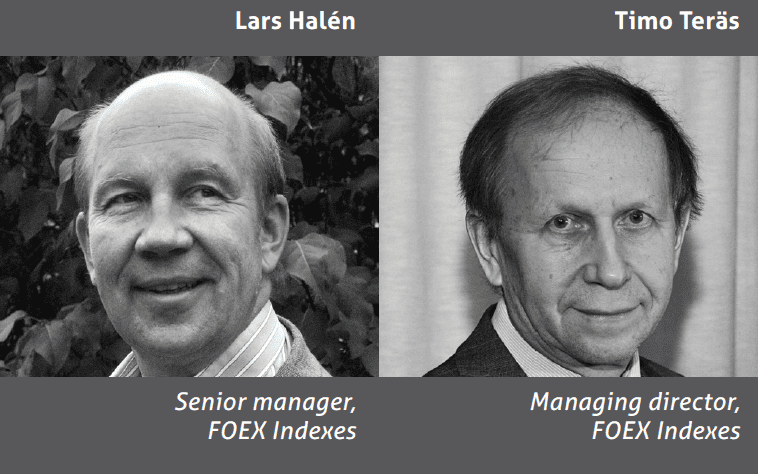 Please enquire for subscriptions at foexsubs@risi.com or via the following link www.foex.fi/subscribe/. Tissue papers are produced either from virgin fibre, recovered fibre and various mixes of both, depending on the end product. High quality hygiene tissue products like medical tissue products, facial tissues, table napkins or other such household and sanitary products are often made exclusively or almost exclusively from virgin fibre pulp, whereas the share of recovered fibre typically increases in tissue products for a variety of end uses outside personal hygiene, such as kitchen towels or towels for garages or other such industrial production facilities etc. Providing PIX pulp price indices gives the paper producer and buyer insight in the price trends with a weekly frequency. PIX indices are used as market reference prices e.g.